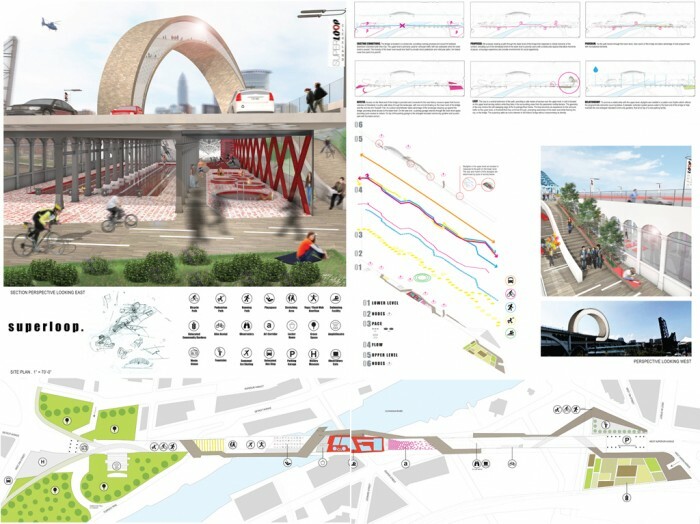 Overview: We began by examining the bridge and realized that allowing the bridge to maintain its current linear layout that doesn’t engage its surroundings made no sense. We solved this problem by creating a path that stretches through the lower level of the bridge that responds to critical moments of the context, extruding out of the formalized shell of the lower level to provide users with unobstructed spaces that allow moments of pause, encourage experience and provide environments for social opportunity. As the path travels through the lower level, clear spans of the bridge are taken advantage of and programmed with recreational elements. To promote a relationship with the upper level, skylights are installed in a pattern and rhythm which reflects the programmatic elements occurring below. A rainwater collection system pumps water to the East end of the bridge to help maintain the new enlarged relocated community gardens, that sit on top of a new parking facility. At the West end, the path splits into two, molding the landscape to formalize the History Museum dedicated to the city and the bridge and an outdoor amphitheater, before terminating into the Towpath trail. 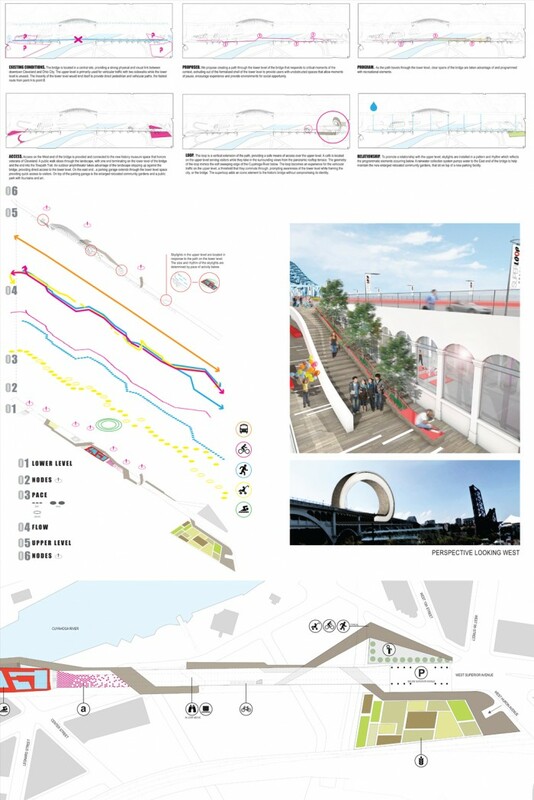 The final component of the design was to extrude the path vertically, providing a means of access over the upper level of the bridge allowing for an café and observatory. The superloop becomes an experience for the vehicular traffic on the upper level, a threshold that they commute through, prompting awareness of the lower level while framing the city, or the bridge. 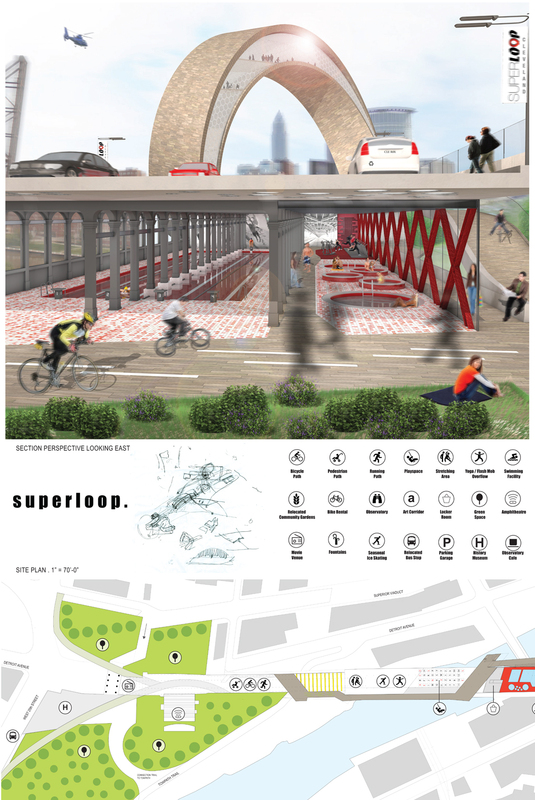 The superloop adds an iconic element to the historic bridge without compromising its identity.